چشمه‌های لرزه‌ای نقش مهمی در برآورد خطر در فرایند تحلیل خطر لرزه‌ای ایفا می­کنند. انتخاب این مناطق بیشتر بر پایه قضاوت‌های کارشناسان انجام می‌شود و در بیشتر موارد، تعیین چشمه‌های لرزه‌ای توسط چند کارشناس نتایج متفاوت و بحث‌برانگیزی را دربر دارد. از این ‌رو، یکی از عوامل مهم در ایجاد عدم قطعیت در تحلیل خطر می‌تواند به دلیل چگونگی انتخاب چشمه‌ها باشد. نسبت دادن رخدادهای گذشته به هر چشمه لرزه‌ای مسأله مهم بعدی تحلیل خطر زمین‌لرزه است که این کار نیز توسط قضاوت‌های بصری کارشناسان انجام می‌شود و از آنجایی‌که گسل مسبب هر رخداد به‌طور واضح مشخص نیست؛ مانند تعیین چشمه‌های لرزه‌ای، این شیوه نتایج مبهمی دارد. در پژوهش حاضر سعی شده است که با استفاده از روش‌ بهینه‌سازی توده ذرات به‌منظور خوشه‌بندی فازی، به‌طور هم‌زمان چشمه‌های لرزه‌ای تعیین ‌شده و رویدادهای لرزه‌ای به گسل‌ها نسبت داده شوند. الگوریتم مورد استفاده بر پایه کمینه‌سازی دو تابع هدف فاصله رویداد‌ها از گسل و مرکز خوشه (مرکز چگالی رویدادها) کار می‌کند. این الگوریتم به دو حالت روی داده‌های ناحیه شمال باختر ایران اعمال شد؛ در حالت اول فاصله مورد محاسبه فاصله اقلیدسی بوده است و در حالت دوم فاصله ماهالانوبیس در محاسبات در نظر گرفته شدند. برای ارزیابی درستی الگوریتم، از رویداد‌هایی که از پیش به گسل‌ها نسبت داده‌ شده‌اند استفاده شد. مقایسه خروجی‌های الگوریتم با بانک اطلاعات زمین‌لرزه‌های نسبت داده‌ شده گذشته نشان داد که 2/79 درصد از این رویدادها با در نظر گرفتن فاصله اقلیدسی و 5/87 درصد از این رویدادها با در نظر گرفتن فاصله ماهالانوبیس به ‌درستی به گسل‌ها اختصاص یافتند که نشان از عملکرد خوب روش پیشنهادی این مطالعه با استفاده از فاصله ماهالانوبیس دارد. نتایج حاصل نشان می‌دهند که رویکرد پیشنهادی به مهندسین زمین‌لرزه‌شناسی کمک می‌کند تا با عدم قطعیت کمتری در فرایند تحلیل خطر لرزه‌ای افزون بر تعیین چشمه‌ها، زمین‌لرزه‌ها را به گسل‌ها اختصاص دهند. Seismic source zones have an important role in hazard assessment in probabilistic seismic hazard analysis. These zones often determined according to judgments by experts are, in most cases, non-uniform across a specific region and typically controversial. Thus, most of the uncertainty in probabilistic seismic hazard analysis can be related to the delineation of seismic sources. Another problem of probabilistic seismic hazard analysis is the way earthquakes are associated with the faults. Even though it is well-known that earthquakes happen on faults, but most of them are still unknown, this constrains the realization and assessment of seismic risks by experts. This paper attempts to determine seismic sources and associate events to faults using a fuzzy particle swarm optimization clustering algorithm. The algorithm works based on the minimization of two objective functions: distance from events to fault, and distance from events to their center of density (i.e. cluster center). The algorithm is applied on seismic data acquired from northwest of Iran, and its performance is evaluated based on the events assigned to the faults by previous researchers. Comparing associated earthquakes to faults by the algorithm in northwest of Iran with known and documented earthquakes, reveals that, 79.2% of the events are correctly induced by faults. Final result shows that, this methodology will help seismological engineers take a step forward in hazard analysis by determining seismic sources and assigning earthquakes to different active faults. Abraham, A. and L. Jain, L., 2005- Evolutionary Multiobjective Optimization, Springer London, p1-6. Ambraseys, N. and Melville, C., 1982- A History of Persian Earthquakes Cambridge Univ, Press, New York. Ansari, A., Firuzi, E. and Etemadsaeed, L., 2015- Delineation of Seismic Sources in Probabilistic Seismic‐Hazard Analysis Using Fuzzy Cluster Analysis and Monte Carlo Simulation, Bulletin of the Seismological Society of America 2191-2174, V. 4, p. 105. Berberian, M., 2014- Earthquakes and coseismic surface faulting on the Iranian Plateau a historical, social and physical approach, Elsevier. Berberian, M., 1976- Seismotectonic map of Iran, Geological Survey. Bianchi, L., Dorigo, M., Gambardella, L. and Gutjahr, W., 2009- A survey on metaheuristics for stochastic combinatorial optimization, V. 8(2), p. 239-287. Binu, D., 2015- Cluster analysis using optimization algorithms with newly designed objective functions, Expert Systems with Applications, V. 42(14), p. 5848-5859. Blum, C. and Roli, A., 2003- Metaheuristics in combinatorial optimization: Overview and conceptual comparison, ACM Comput, Surv, V. 35(3), p. 268-308. Burton, P. and Hall, T., 2014- Segmentation of the Sumatran fault, Geophysical Research Letters, V. 41(12), p. 4149-4158. Burton, P., Weatherill, G., Karnawati, D. and Pramumijoyo, S., 2008- Seismic hazard assessment and zoning in Java: new and alternative probabilistic assessment models, International Conference on Earthquake Engineering and Disaster Mitigation, Jakarta. Chen, C. and Ye, F., 2004- Particle swarm optimization algorithm and its application to clustering analysis, Networking, Sensing and Control, IEEE International Conference on . Committee, S. and Budnitz, R., 1997- Recommendations for probabilistic seismic hazard analysis: guidance on uncertainty and use of experts, US Nuclear Regulatory Commission Washington, DC. Coppersmith, K., Youngs, R. and Sprecher, C., 2009- Methodology and main results of seismic source characterization for the PEGASOS Project, Switzerland, Swiss Journal of Geosciences, V. 102(1), p. 91-105. Cornell, C., 1968- Engineering seismic risk analysis, Bulletin of the Seismological Society of America, V. 8(5), p.1583-1606. Das, S., Abraham, A. and Konar, A., 2009- Metaheuristic Pattern Clustering – An Overview, Metaheuristic Clustering, Springer Berlin Heidelberg, V. 178, p. 1-62. Eberhart, R. and Kennedy, J., 1995- A new optimizer using particle swarm theory, Proceedings of the sixth international symposium on micro machine and human science, V. 1, p. 39-43. Eberhart, R. and Shi, Y., 2000- Comparing inertia weights and constriction factors in particle swarm optimization, Evolutionary Computation, Proceedings of the 2000 Congress on. Everitt, B., Landau, S., Leese, M. and Stahl, D., 2011- Optimization Clustering Techniques, Cluster Analysis, John Wiley and Sons, p.111-142. Garey, M. and Johnson, D., 1979- Computers and intractability: a guide to the theory of NP-completeness, San Francisco, LA, Freeman. George, J. K. and Bo, Y., 2008- Fuzzy sets and fuzzy logic, theory and applications. 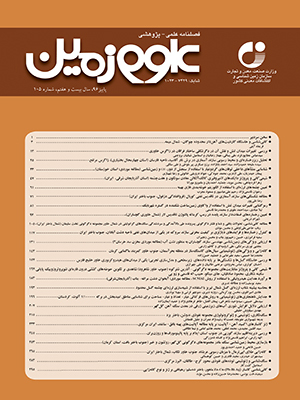 Ghodrati Amiri, G., Razeghi, H., Razavian Amrei, S., Aalaee, H. and Rasouli, S., 2008- Seismic hazard assessment of Shiraz, Iran, Journal of Applied Sciences, V. 8, p. 38-48. Grekousis, G. and Thomas, H., 2012- Comparison of two fuzzy algorithms in geodemographic segmentation analysis: The Fuzzy C-Means and Gustafson–Kessel methods, Applied Geography, V. 34, p. 125-136. Han, J., Kamber, M. and Pei, J., 2011- Data mining: concepts and techniques: concepts and techniques, Elsevier. Kim, Y., Kim, D., Lee, D. and Lee, K., 2004- A cluster validation index for GK cluster analysis based on relative degree of sharing, Information Sciences, V. 168, p. 225-242. MacQueen, J., 1967- Some methods for classification and analysis of multivariate observations, Proceedings of the fifth Berkeley symposium on mathematical statistics and probability, V. 1(14), p. 281-297. Manda, K., Hanuman, A., Satapathy, S., Chaganti, V. and Babu, A., 2010- A Software Tool for Data Clustering Using Particle Swarm Optimization, Swarm, Evolutionary, and Memetic Computing, Springer Berlin Heidelberg, V. 6466, p. 278-285. Manikandan, P. and Selvarajan, S., 2014- Data Clustering Using Cuckoo Search Algorithm (CSA), Proceedings of the Second International Conference on Soft Computing for Problem Solving (SocProS 2012), December 28-30, 2012, Springer, p.1275-1283. Maulik, U., Bandyopadhyay, S. and Mukhopadhyay, A., 2011- Multiobjective Genetic Algorithms for Clustering: Applications in Data Mining and Bioinformatics, Springer Science and Business Media. McGuire, R., 2004- Seismic hazard and risk analysis, Earthquake engineering research institute. Mehdizadeh, E., Sadi-Nezhad, S. and Tavakkoli-Moghaddam, R., 2008- Optimization of fuzzy clustering criteria by a hybrid PSO and fuzzy c-means clustering algorithm, Iranian Journal of Fuzzy Systems, V. 5(3), p. 1-14. Merkle, D. and Blum, C., 2008- Swarm Intelligence: Introduction and Application, Springer Verlag Gmbh. Mirzaei, N., Gao, M. and Chen, Y., 1999- Delineation of potential seismic sources for seismic zoning of Iran, Journal of Seismology, V. 3(1), p. 17-30. Mirzaei, N., Mengtan, G. and Yuntai, C., 1998- Seismic source regionalization for seismic zoning of Iran: major seismotectonic provinces, Journal of Earthquake Prediction Research, V. 7, p.465-495. Musson, R., 2004- Objective validation of seismic hazard source models, 13th World Conference on Earthquake Engineering 2492. Ouillon, G., Ducorbier, C. and Sornette, D., 2008- Automatic reconstruction of fault networks from seismicity catalogs: Three-dimensional optimal anisotropic dynamic clustering, Journal of Geophysical Research: Solid Earth, V. 113(B1). Ouillon, G. and Sornette, D., 2011- Segmentation of fault networks determined from spatial clustering of earthquakes, Journal of Geophysical Research: Solid Earth, V. 116(B2). Runkler, T. and Katz, C., 2006- Fuzzy Clustering by Particle Swarm Optimization, Fuzzy Systems, IEEE International Conference on. Shahvar, M., Zare, M. and Castellaro, S., 2013- A Unified Seismic Catalog for the Iranian Plateau (1900–2011), Seismological Research Letters, V. 84(2), p. 233-249. Spada, M., Wiemer, S. and Kissling, E., 2011- Quantifying a Potential Bias in Probabilistic Seismic Hazard Assessment: Seismotectonic Zonation with Fractal Properties, Bulletin of the Seismological Society of America, V. 101(6), p. 2694-2711. Tsai, C., Huang, W. and Chiang, M., 2014- Recent Development of Metaheuristics for Clustering, Mobile, Ubiquitous, and Intelligent Computing. Springer Berlin Heidelberg, V. 274, p.629-636. Wang, Y., Ouillon, G., Woessner, J., Sornette, D. and Husen, S., 2013- Automatic reconstruction of fault networks from seismicity catalogs including location uncertainty, Journal of Geophysical Research: Solid Earth, V. 118(11), p. 5956-5975. Weatherill, G. and Burton, P., 2009- Delineation of shallow seismic source zones using K-means cluster analysis, with application to the Aegean region, Geophysical Journal International, V. 176(2), p. 565-588. Welch, W., 1982- Algorithmic complexity: three NP- hard problems in computational statistics, Journal of Statistical Computation and Simulation, V. 15(1), p. 17-25. Woo, G., 1996- Kernel estimation methods for seismic hazard area source modeling, Bulletin of the Seismological Society of America, V. 86(2), p. 353-362. Zadeh, L., 1965- Fuzzy sets, Information and Control, Elsevier, V. 8(3), p. 338-353. Zhao, M., Tang, H., Guo, J. and Sun, Y., 2014- Data Clustering Using Particle Swarm Optimization, Future Information Technology, Springer Berlin Heidelberg, V. 309, p.607-612. Zhongbin, O., Jing, H. and Keliang, Z., 2008- Data Mining for Seismic Exploration, Web Intelligence and Intelligent Agent Technology.